Most people, thankfully, never have to experience the horror of losing a child to violence. When a child is murdered, it is natural to want the killer brought to justice and punished. 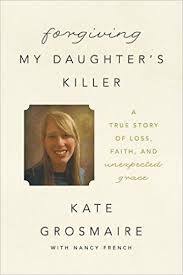 In the touching book Forgiving My Daughter's Killer, Kate Grosmaire discusses the terrible events surrounding her daughter's death, and how she was able to find peace through forgiveness for the perpetrator of the crime. Ann Grosmaire was a 19 year old college student living in Florida when her life tragically ended. Her parents were at home on a normal Sunday in Tallahassee when their lives were changed forever by the arrival of two police detectives at their front door. The news that their daughter had been shot and was in the hospital fighting for her life was terrible enough, but worse news was to come: she had been shot by her boyfriend of two years, Conor McBride. Believing he had killer her, Conor had driven around aimlessly for nearly an hour before going to a police station and confessing to murder. Amazingly, despite a devastating head wound, Ann was still alive. At the hospital, her parents, Andy and Kate, are surrounded by family, friends and fellow church members. After a while, they are also joined by some unexpected visitors: Conor's parents. While shocked and concerned for their daughter's welfare, the Grosmaires nevertheless are compassionate and helpful to Conor's parents, feeling that their lives have also been turned upside down. Kate is also shocked to learn that Conor has listed her as one of the four people permitted to visit him in prison. Through difficult times in her marriage, Kate Grosmaire had to deal with forgiveness, and came to realize that forgiving the person who had wronged her allowed her to let go of her own anger. After Ann's death, she and her husband become intrigued with the idea of restorative justice for Ann's killer. This idea allows for the criminal to work toward understanding the people he has injured with his behavior, and to work toward some sort of restitution. Of course, in this instance there is no way to bring Ann back, but her parents felt that by participating in Conor's punishment and rehabilitation, they could ensure that he would have a chance at a better life than just being warehoused in a prison. It involved the parents of the victim and the perpetrator, as well as the perpetrator sitting down with mediators and discussing the crime and how it has effected everyone. It also allowed the Grosmaires to have a say in the type of sentence Conor would receive. The book ends with a Q & A with Conor himself. All in all, I found the book to be a moving story of how parents received the worst news possible, yet were able to keep from letting their grief turn to anger. Their work with restorative justice has prompted other people in similar situations to contact them for help and advice.